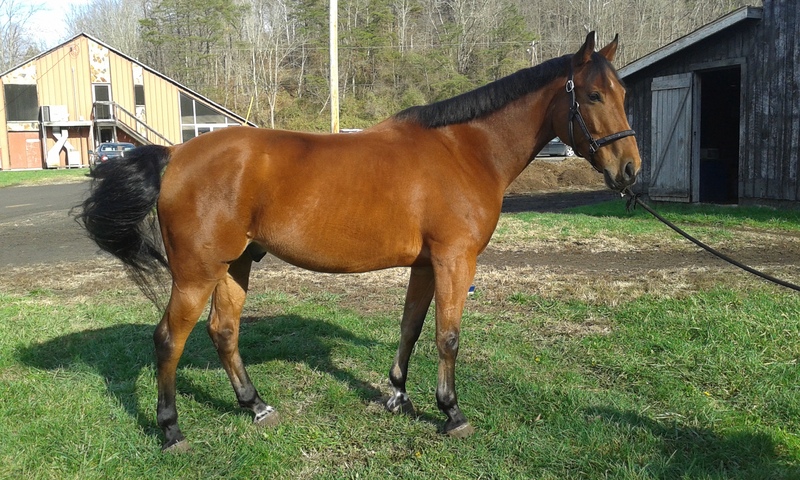 2010 16.2H OTTB gelding. Titan aka Perfect Title is quiet on the trails, cute and sane over fences. No buck, rear or bolt. Titan is more of a kick ride, and a great project for someone looking for a willing partner. Being sold by no fault of his own, as owner is moving and can’t bring him. Titan did have bone chips removed out of front fetlocks during his race career- and was cleared to continue racing before he was started in his new career. No soundness issues or vices, loads and stands quiet for farrier. Titan has been to a few shows at the cross rail level and is absolutely ready to go on to bigger things! Click Here for youtube video of Titan! 2010 Holsteiner/ Quarter pony cross. 13.2 hands. This mare is a delight to have in the barn! Very sweet and level headed, with a lovely rhythmic canter and nice square jump. Has just been started over fences and has scope to do much more than is shown in this video! Apple will do great in the children’s pony hunters or medium division. Still green eligible, price will increase with training and show experience. Sale includes USEF lifetime registration. 16.1 Hand 2010 Thoroughbred Gelding. Very rhythmic and steady, would make a great hunter. Currently schooling up to 3′, with scope for more. He has free schooled up to 4’6″! Suitable for an amateur, or timid rider. This gentleman gelding has a rare quiet attitude for his age. Click Here for video! 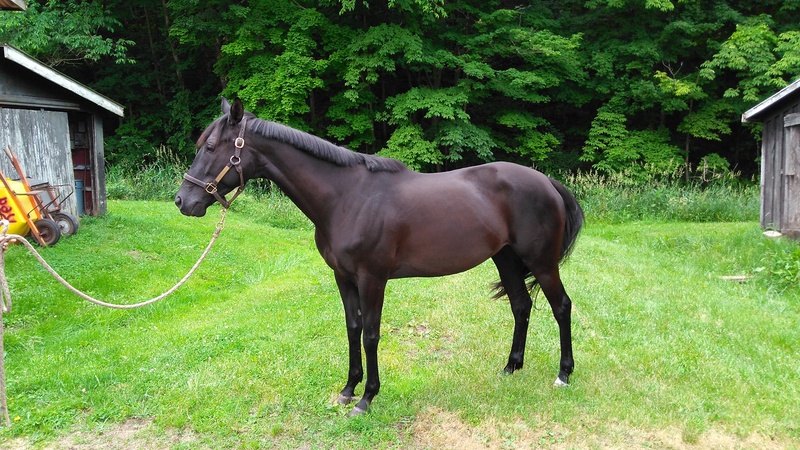 2011 16H black thoroughbred mare. Raced until June of 2016: retired sound with nice clean legs. Piper has an incredibly laid back and sweet attitude towards life. Schooling up to 3’3″ with a careful, rhythmic and relaxed jumping style, with scope for much more! Piper is quite brave about any new obstacle including water, and doesn’t have a stop in her. She is a delight to have in the barn and loves attention, we believe she will make a great eventing or hunter/jumper prospect for someone wanting to bring along a nice prospect. Loads, clips, and stands quiet for the farrier. Piper competed in her first hunter show in April of 2017- receiving two first place ribbons! 16.2 H 8 yr old Swedish Warmblood gelding. Sire is Asterix. Correctly started with a dressage background. Arthur has started his jumping education with Jenny and is showing talent for the Hunter ring. This big boned, rhythmical moving gelding is a real joy to ride. Very steady and even tempered, Arthur would make a great horse for an amateur or timid rider. Currently schooling 3′, and steadily moving up in his training. Price will increase with training. Benevolence is a 2011, 16.1 hand Hanoverian gelding currently in training with Jenny Fair. His sire is Hilltop Farm’s Bugatti. Ben has started under saddle and is showing the athleticism and even-temperment expected of his breeding. With 3 very correct and expressive gaits; Ben will excel in the dressage or hunter/jumper disciplines. See Ben’s profile at Dreamhorse.com. Rinaldo is a 2007 andalusian stallion, IALHA reg. # 10943(s). He also has his lifetime registration with the USEF and USHJA (reg. #4975949), and is microchipped. This horse is extremely healthy, solid, and 100% sound. His DNA is EeAa. 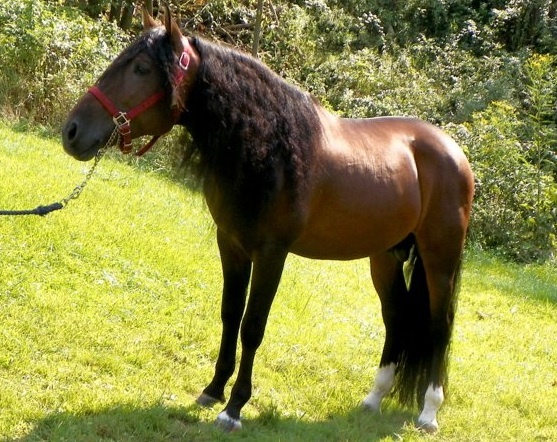 This stallion is the embodiment of his amazing bloodlines. Rinaldo’s sire, Diego MC, is three quarters Military blood and is from a long line of champions, all well known for their functionality and elastic movements. Rinaldo’s dam, Costosa, is an own daughter of the Olympic dressage Andalusian Aureolo VII of Spain. Costosa has an extensive and successful show career of her own. Details of both parents of Rinaldo can be seen at tintagelandalusians.com (courtesy of Sarah Hollis). Rinaldo stands 15.1 hands, and is superbly balanced. His conformation is exceptional. His hindquarters are massive, with large, strong hocks and substantial canon bones. Rinaldo naturally engages his hindquarters, due to the ideal angles in his hips and shoulders. He is broad and square, with straight legs at each corner, and strong well shaped hooves. Always ready to go, Rinaldo is an amazing combination of strength, beauty, stamina, and balance. Rinaldo is a highly confident, athletic and agile horse, but easily ridden by a confident person. He has been trained in the reining maneuvers (sliding stop, spins, rollbacks, lead changes) and can perform them all correctly on a loose rein. Currently in training with Jenny Fair for dressage, Rinaldo is proving his remarkable bloodlines, progressing quickly through the levels, currently schooling third level. Rinaldo has begun jumping training, and thoroughly enjoys it, showing scope and commitment. He has also been introduced to a mechanical cow, and is very interested and shows promise of becoming a real cow horse. His canter is nothing short of magical, and every single person who has had the privilege of riding this amazing horse has fallen in absolute love with him after the very first ride. See lots more videos at the youtube channel “Rinaldo Andalusian”. Rhoda is a 13 year old 15.3 hand, Draft cross Mare. She has been used in a lesson program, with beginner – intermediate riders learning to jump. She has spent a season hunting in Tennessee and is a joy to ride. This eye catching mare has all the bone and substance, with an athletic jump. She has schooled up to 4′, and is working on the half pass, shoulder in and haunches in. Rhoda would make a wonderful mount for a rider looking for a hunt horse, eventer, jumper or dressage partner. 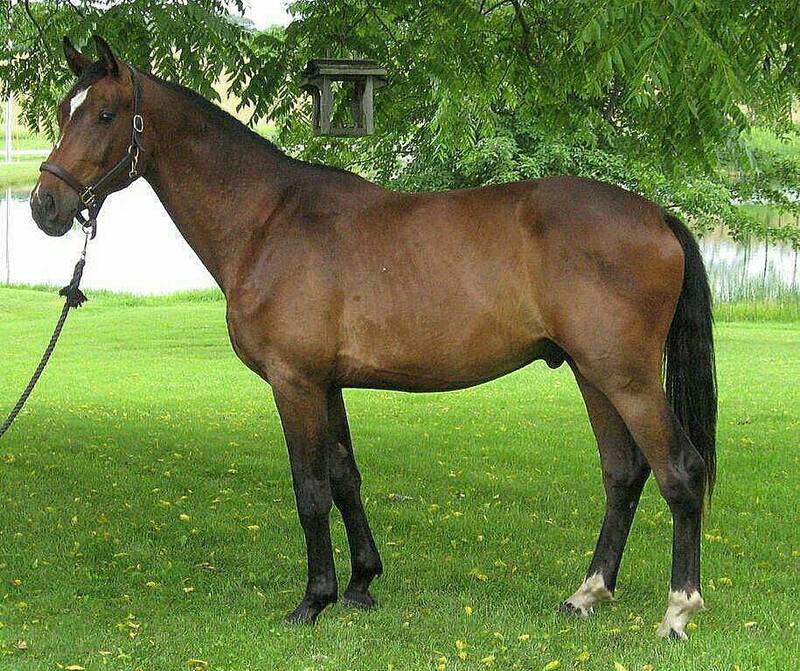 Ande is a 2005 Hanoverian/Oldenburg Mare 16.2H. She has started her career in Dressage, and came to Jenny Fair to try out eventing. This mare has taken to her new job with enthusiasm, and a level headed attitude. She has had a successful first season at Novice this year and should move up the levels quickly! This amazing mare doesn’t bat an eyelash at any cross country or show jumping question, and has all the talent to wow in the Dressage phase. Delta is a 2006 16.2 hand Thoroughbred gelding out of Empire Maker. Delta has xc schooled novice and training level questions, participated in hunter paces, and schooled up to 3’6″ jumping. Schooling shoulder-in, haunches in and half pass. This horse has an amazing presence and 3 fantastic gates.